AS Pest Control provide an efficient, affordable and professional silverfish control service in Mansfield. Available 24/7 we offer a quick and reliable service to conveniently remove the silverfish problem. Do I Have a Silverfish Problem? Silverfish grow to about 1/2 inch in length and are covered in silvery scales. They eat material high in protein, sugar or starch including cereals, moist wheat flour, starch in book bindings, sizing in paper and paper on which there is glue or paste. They will often attack wallpaper, eating irregular holes through the paper to get to the paste. They may also bite very small holes in various fabrics. 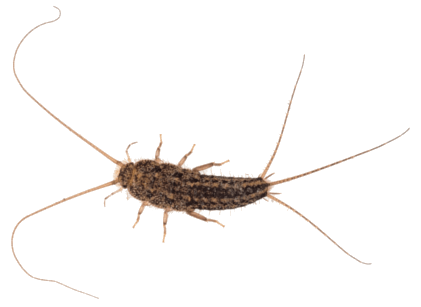 Silverfish are found in bookcases, closet shelves, behind baseboards and in kitchens. They prefer kitchens and bathrooms because of the moisture. They malt as many as 50 times during their adult life so the appearance of cast skins can signify they are present. Contact AS Pest Control and we can provide a free onsite silverfish control Mansfield quotation. To discourage silverfish removing the moist, humid environment by fixing leaks in pipework, improving ventilation and using dehumidifiers can help. Keeping dust and debris to a minimum, vacuuming rarely disturbed areas and keeping food stored in sealed containers will help to remove food available. Large populations will need to be professionally treated using targeted solutions. AS Pest Control provide Silverfish Control in Mansfield starting from only £60. AS Pest Control will always assess the silverfish infestation and use the most appropriate treatment for each case. All areas for treatment need to cleared and washed down or vacuumed to ensure the treatment can be effective. An insecticidal spray will then be used to treat the areas where the silverfish are commonly seen. Ensure any leaking pipework is fixed and look at options to remove moisture from the infected rooms either by improving ventilation or by installing a dehumidifier. AS Pest Control provide a local, affordable silverfish control solutions for residential and commercial customers in Mansfield, Nottingham, Derby, Chesterfield, Worksop and surrounding areas.